Why is MetService introducing a Severe Thunderstorm Warning Service? Thunderstorm forecasting methods and forecaster expertise. What is “localised severe weather”? Most of New Zealand’s severe weather is brought about by big weather systems like lows and fronts. But some severe weather events are the result of severe thunderstorms. Severe weather that is related to thunderstorms usually occurs over a much smaller area, and lasts for a much shorter time, than severe weather related to lows and fronts. This is because thunderstorms are much smaller weather systems than, and last for much less time than, lows and fronts. But the sheer intensity of the rainfall, hail and/or wind associated with some thunderstorms can pose just as big a threat to life and property. Below is an example of the difference in scale. 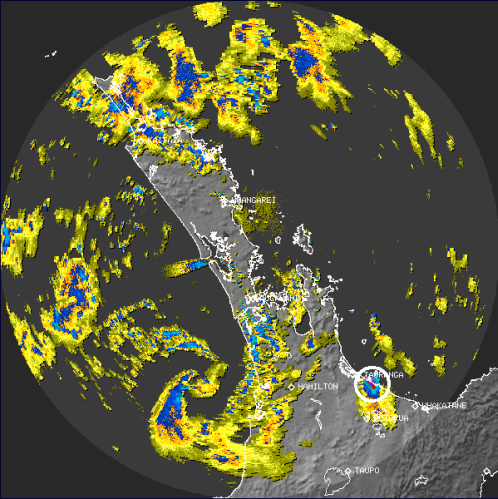 Broad-scale heavy rainfall over northern New Zealand (the first image) is of far greater extent than a local severe thunderstorm in coastal Bay of Plenty (the second image, circled). Heavy rainfall over almost all of Northland and parts of Auckland and Coromandel, 7:21am 10 July 2007. Overall, this heavy rainfall event lasted at least a day. According to the Insurance Council of New Zealand, about $60 million in insurance claims resulted from this event. Severe thunderstorm just east of Tauranga, 11:59 am 11 May 2009. This event lasted a few hours altogether, and much less than that in any one location. While there is a lot of echo on the radar scope, the small area near Tauranga is the only place where severe weather is occurring. A narrow swath of heavy hail affected the Bay of Plenty coast from near Tauranga to near Opotiki. In locations more than about a kilometre from the thunderstorm, severe weather didn't occur. When do severe thunderstorms occur? In eastern and inland parts of New Zealand, severe thunderstorms primarily occur on some afternoons and evenings in spring and summer. In western parts of New Zealand, though, they can occur any time. For example, there were tornadoes in New Plymouth on 4 and 5 July 2007 – the middle of winter. And they can occur in the middle of the night. The size and lifetime of a weather system (for example, low, front, thunderstorm) influences how far ahead in time the weather related to it can be forecast. The warning system for small-scale severe weather mimics that for broad-scale severe weather, as shown below. But when small-scale severe weather is expected, the forecast has much less lead time. How often do severe thunderstorms occur? Thunderstorms occur reasonably often in New Zealand. Severe thunderstorms are much less common, occurring perhaps once a month or less. Your chances of experiencing one are fairly small. But if you are under or near one, it is important that you know what to do to try and keep yourself and your property safe. What can I do with less than 60 minutes’ notice? How does MetService detect thunderstorms? Weather radar is essential for the detection and forecasting of small-scale severe weather events. The amount and quality of data decreases with distance from a weather radar. For these reasons, warnings of severe thunderstorms will only be available within about 150 kilometres of a weather radar. 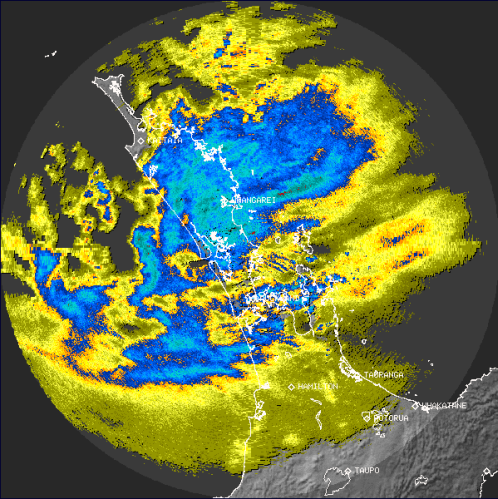 How many weather radars does MetService have, and where are they? In the maps below, the bright blue areas are both within 150 km of a weather radar and contain enough weather radar information to provide Severe Thunderstorm Warnings. Siting weather radars in New Zealand is a challenge because hills reduce, or in some cases completely block, the radar signal. This is why, for example, the Canterbury radar provides no coverage of the South Island West Coast. Intended radar coverage in about 2012 (with the exception of Otago, for which funding has not yet been secured). Over the next three or so years, weather radars will be installed on Mahia Peninsula (third quarter of 2009), in western Bay of Plenty, Northland and on the South Island West Coast. Sites for radars in western Bay of Plenty, Northland and on the South Island West Coast are being pursued but have not yet been finalised. MetService has a group of very experienced forecasters whose focus is severe weather. Every day, one of the things they do is issue the Severe Weather Outlook and the Severe Thunderstorm Outlook. The Severe Weather Forecasters issue Watches or Warnings when they expect the warning criteria to be met. Because they are not based on radar information, the Severe Thunderstorm Outlook and Severe Thunderstorm Watch are available New Zealand-wide. In contrast, Severe Thunderstorm Warnings are referenced to radar areas. Further, no Severe Thunderstorm Warning will be issued for a location greater than 180 km from any of New Zealand's weather radars. A Severe Thunderstorm Warning will only be issued once a severe thunderstorm exists and can be tracked. This might be 30 minutes after it developed. In other words, by the time you receive a Severe Thunderstorm Warning, there is already a severe thunderstorm. How can I receive Severe Thunderstorm Warnings? Severe Thunderstorm Warnings will be based around weather radars rather than around districts. 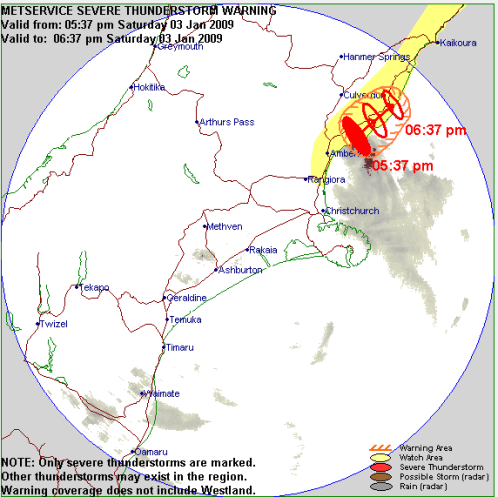 That is, the occurrence of a severe thunderstorm within, say, the Wellington radar area will prompt the issue of a warning for the Wellington radar area. Prominent in the warning heading will be the location it applies to (e.g., Blenheim, Paraparaumu, Upper Hutt, etc). Avoid streams and drains as you may be swept away in flash flooding. This warning is due to be updated or lifted by 06:37 pm Saturday 03 January 2009. NOTE: Only severe thunderstorm tracks are shown in the graphic. Other thunderstorms may exist in the area. MEDIA PLEASE NOTE: This warning will be updated within the next hour or so. MetService would appreciate it being broadcast regularly during this period. Appendix II: What is a thunderstorm, anyway? A thunderstorm is a local storm produced by a cumulonimbus cloud. In the photograph on the right, the tall cloud in the middle of the frame with an anvil-shaped top is a cumulonimbus cloud. (And without weather radar, there is no way of knowing whether this is a severe thunderstorm … unless you’re underneath it). 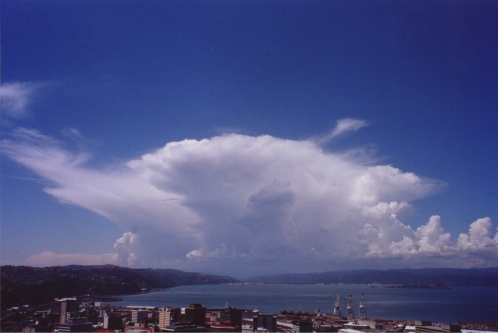 Impressive cumulonimbus (thunderstorm) seen from MetService. Image courtesy Allister Gorman, MetService. Vigorous, fast-moving cold fronts moving from west to east across New Zealand. These occur at any time of the year, night or day. Southerly changes along the east coast, especially Canterbury, and especially during the warmer part of the year. In both these situations, the thunderstorms are commonly arranged in lines along or near the front / southerly change. Afternoon and evening "build-ups" inland during the warmer part of the year. Humid north or northwest flows driven up over high ground. In these situations, the thunderstorms occur more randomly. Rainfall of 25 millimetres per hour, or more. Hailstones 20 millimetres in diameter, or larger. Gusts of 110 kilometres per hour (60 knots) or stronger. Fujita F1 (wind speeds greater than 116 kilometres per hour (63 knots)) or stronger. Cause structural damage, blow trees over, etc. Damage swaths as for hail.